The 24-square-metre centre is equipped with the latest digital learning equipment. IT products and services provider Fujitsu has partnered with Sizwe Africa IT Group to build digital classrooms for schools in SA's rural areas. 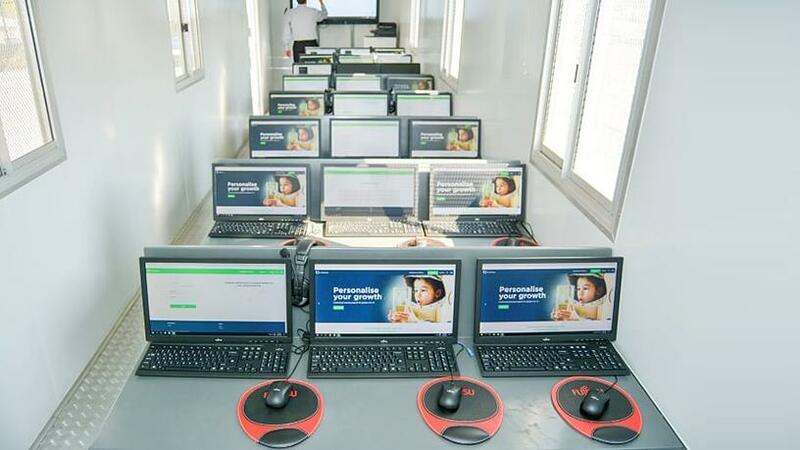 The companies today unveiled self-sustaining computer-driven classroom facilities. The Edu-Smart Green Centres are equipped with Fujitsu technology to help digitise government schools around SA. The 24-square-metre solar-powered classroom is constructed like a shipping container and features 27 seats, each with a Fujitsu FUTRO for secure computing and desktop virtualisation. Pupils sit in front of dedicated displays, while the educator has an intelligent interactive whiteboard touchscreen to complement additional learning materials, according to Fujitsu. Sizwe Africa IT Group provides the infrastructure while Fujitsu provides the hardware. The concept, layout and structure were jointly developed. "This project, jointly driven by Fujitsu and Sizwe Africa IT Group, truly embodies our ambition. Through the intelligent application of technology, we are making a positive contribution to every community that is reached by the classrooms," explains Steven Kramer, channel and marketing manager at Fujitsu SA. "Extending digital learning to these young people gives them previously unthinkable opportunities to secure a better future through education." In SA, there are few schools or education opportunities in remote rural areas, which means a large percentage of children who start at grade one face enormous challenges in reaching their grade 12 national senior certificate, notes Fujitsu. The Edu-Smart Green Centre is scalable and self-sufficient. The classroom can be built, delivered and fully functional within 10 weeks, eliminating significant delays in comparison to building with brick and mortar, it adds. "The digital classrooms are run 100% by solar panels located on the roof and have battery backups, which mean no impact on the grid. While they have Internet connectivity, they are also designed to run without Web access through an offline facility, since mobile network connectivity is patchy or non-existent in remote areas. This also eliminates the cost of mobile data," adds Kramer. The companies were not able to provide the names and areas of schools at this stage. Jos Matthysen, executive of managed services at Sizwe Africa IT Group, says: "We are committed to improving the opportunities for school-age children in SA by providing local and rural areas with access to education. Our self-sufficient classrooms bring interactive content to learners and can be used with or without a teacher or text books." Sizwe Africa IT Group has established a corporate social initiative education programme, by partnering with corporates that would like to purchase the mobile containers to donate as part of their corporate social initiatives. Its previous partners include Epson and Kyocera Document Solutions. The race to teach students digital skills is heating up, with three companies last month introducing digital learning initiatives: I-Innovate introduced the "AI and Robotics for the Future" programme at the Diepsloot Combined School. Qberty Skills Academy opened the Coders and Innovators Hub at Northriding Shopping Centre in Randburg. Global enterprise software vendor IFS committed to sponsoring learning programmes for 30 unemployed South African youth.